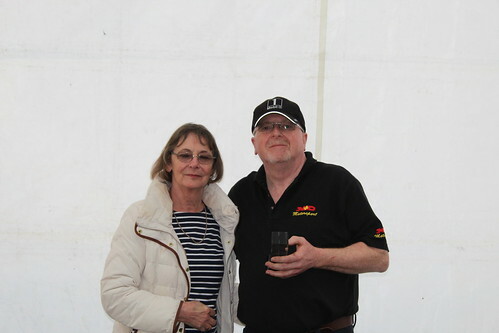 On the Friday evening before the race weekend was to begin there was considerable concern about the light levels at 6 PM in view of the fact we were to start our first race at that very time the following day. At 6.05 PM on Friday it was DARK, the evening gloom settling over the circuit beneath an overcast sky, and by 6.15 headlights were needed in the Paddock. 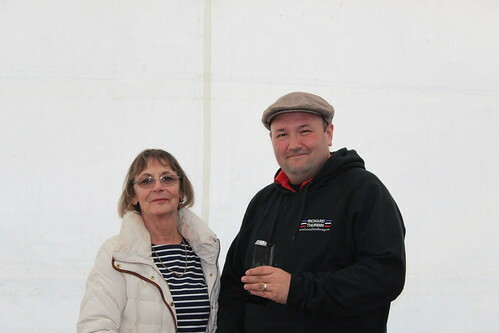 These concerns were reflected in the driver briefing at noon on Saturday, at which our Clerk of the Course assured us he would do his utmost to get the programme running ahead of schedule to avoid the problem. Fortunately too, the sky was much brighter than it had been the day before so we had everything crossed that the light would be adequate. 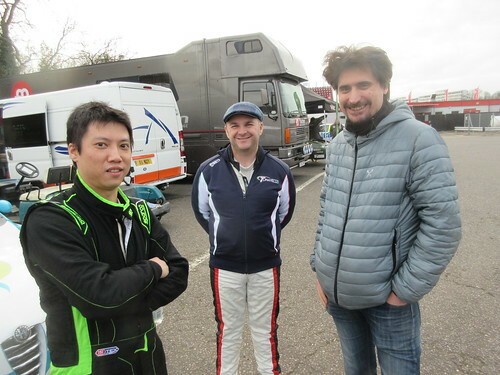 We were delighted to welcome 4 new drivers to the Championship: Richard Thurbin in his beautiful Modified Lancia Delta Integrale 16v, Gary Miller in his well prepared Punto Abarth, Eric Yim in the ex-Andy Hancock 156 Twin Spark, and Ben Sharich in the brand new Alfa MiTO, built by the ebullient Davie Peddie up in Fife under the auspices of the MiTO Register of the Owners’ Club led by David Faithful. 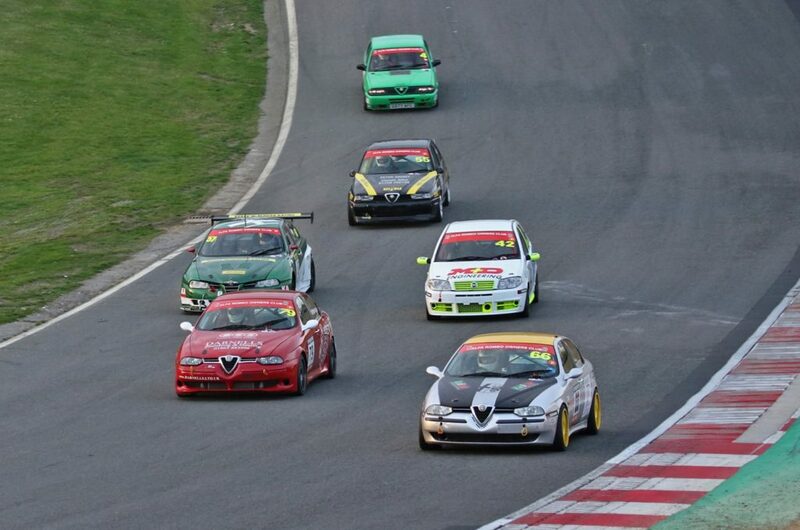 This was a seminal moment for the Championship – a forerunner of what we hope will be an increasing number of Alfas from more recent years running alongside our more established (and equally valued) range of cars. Full credit goes to Davie, David and their team for building and preparing the car and getting it to the first race meeting of the season. We also warmly welcomed Andrew Bourke and Steve O’Brien back to the Championship after an absence, both competing in newly acquired Twin Sparks – a 156 and 147 respectively. Dave Messenger was making his first appearance in the Power Trophy, having acquired his 156 GTA from Roger Evans over the winter, and the redoubtable Keith Waite also appeared in a newly acquired 33 painted an attractive green colour, Keith freely acknowledging that the car wouldn’t be particularly quick but he was intent on enjoying himself, the car destined at some point to be tested by his son Tom. 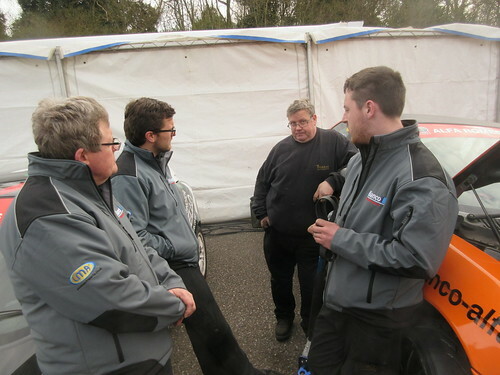 Another novelty was a driver briefing where our drivers were joined by those from the Porsche Championship as we were to have a joint qualifying session, possibly the first of several this year depending on our respective race entry levels at future meetings. 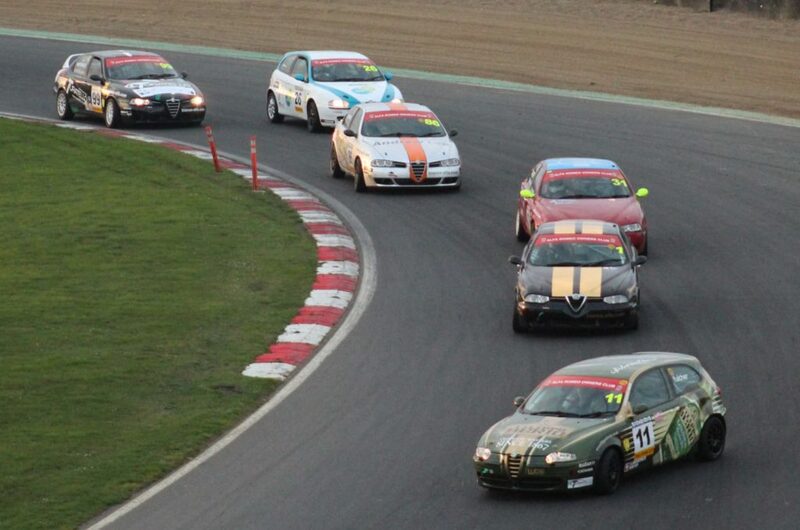 We had 17 entries and the Porsches 11 so 28 in total, well within our maximum grid number of 34 for the circuit. The plan was to send the Porsches out first then, after a time gap, the Alfa Championship cars but after a pre-meeting with the Clerk at which I pointed out that at least 3 of our cars would be as quick as the fastest Porsches the slower Porsche drivers were advised to consider pulling over in the pit lane if they wished to avoid being caught by much quicker cars early in the session, though in the event none did so. 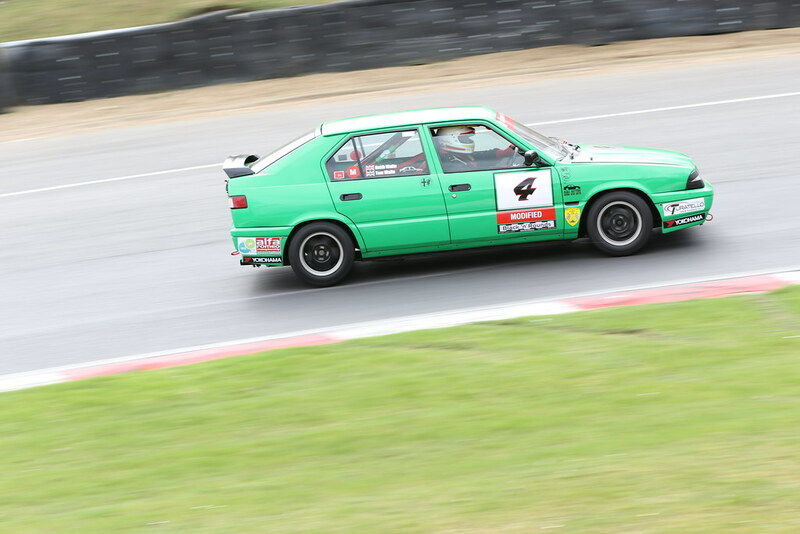 As I made my way to Race Control before the qualifying session I was passed by Simon Cresswell in his 156 Twin Spark on his way to the Assembly area and I noticed that his car was smoking already. Sure enough, after only 2 corners of the first lap his car ground to a halt with what was later discovered to be a seized engine. Bianco not having a replacement, Simon’s weekend was ended there and then, much to his disappointment. 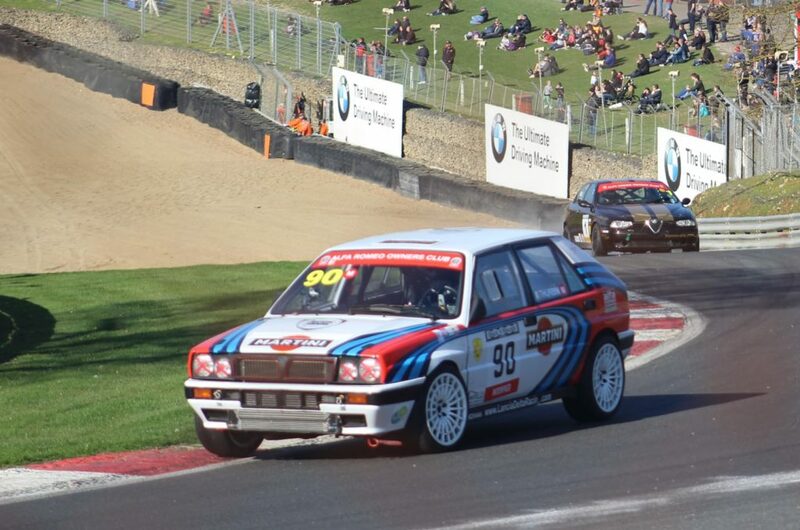 The next casualty of the session was Richard Thurbin’s Delta Integrale. 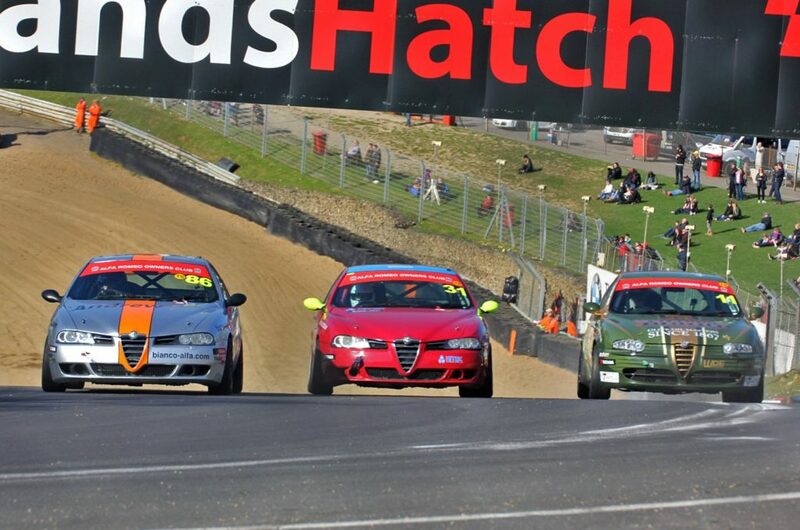 Having got into the 57s on his third lap he then pulled off on the inside of Paddock Hill Bend with a sheared gear selector, ending his session before he could get anywhere near the times his car is capable of. He would therefore have to start on the back row of the Modified/Power Trophy group on the grid. For the rest, a feature of the session was that none of the drivers set their fastest time before their 8th lap and most did so at or very near the end of the session. 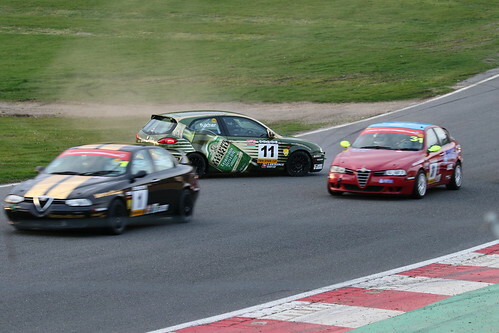 No doubt a little ring rustiness after the winter was part of the reason but also with far more cars on the circuit than we are used to it was proving difficult for some to get a clear lap in. However, on both counts everyone got their head down and the lap times tumbled towards the end of the session. Heading the time sheets was Barry McMahon’s super quick 156 Turbo, looking the absolute business with its green and white livery. A cautious opening few laps saw him go progressively quicker – into 53s on his 5th lap and then, after a couple of slower laps, a blistering 52.294s lap to set pole; job done, he headed for the pits, over 2 seconds quicker than the fastest Porsche which made the time sheets look very impressive from an Alfa perspective! 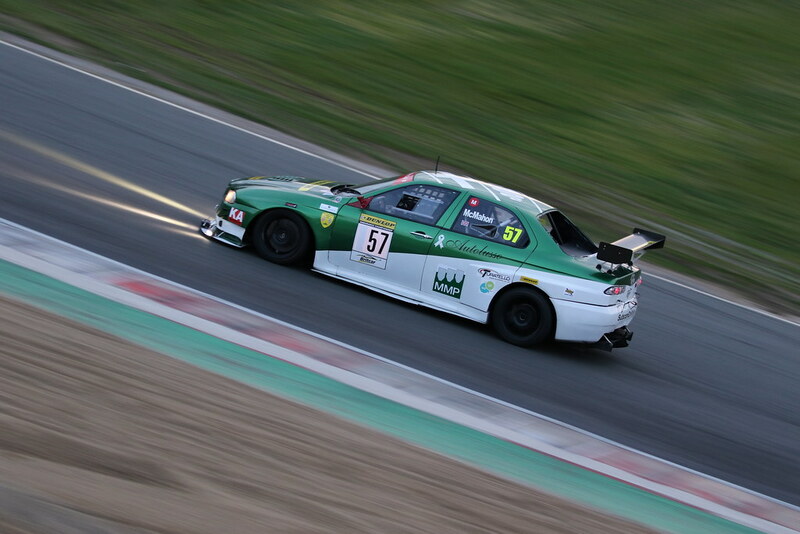 Second quickest was Mervyn Miller in his powerful 156 with a time of 55.871s, set on his penultimate lap. However, just after completing his next lap he found himself with a box of neutrals going into Paddock and understeered off through the gravel before bringing the car back to the edge of the circuit on the exit but unable to move, so the red flag came out 4 minutes early. 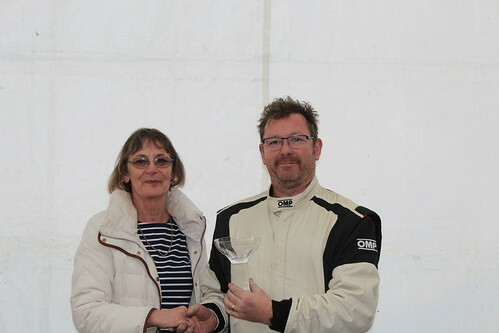 The next 2 quickest drivers were Dave Messenger and Paul Webster, both in 3.2 litre Power Trophy class 156s and each with a slight disadvantage to overcome. 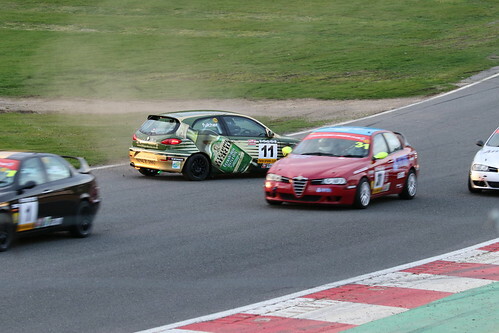 Dave knew the circuit well having driven it numerous times in his Twin Spark but it was his first race meeting in the Power Trophy car, whereas Paul was very familiar with his car but hadn’t raced at Brands before. On this occasion Dave was 3/10ths quicker than Paul with a 56.980 on his penultimate lap. 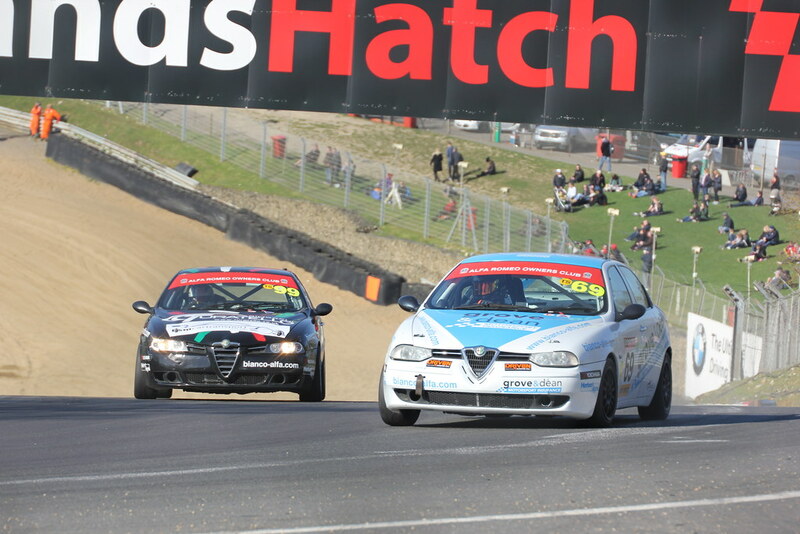 Scott Austin was next – a further 0.5s back in his 155. 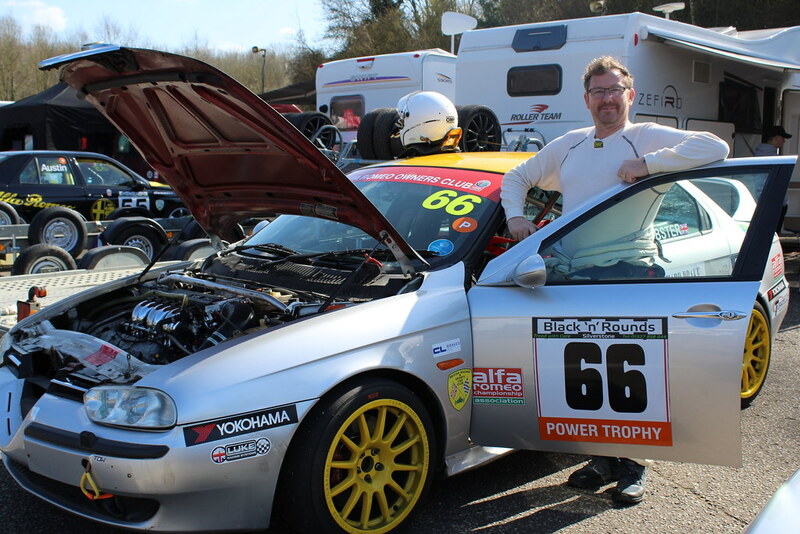 Scott had planned to revamp his car over the winter with a new engine but spent his budget on a motorhome instead! He was relishing his decision on Friday night with a comfortable night’s sleep but regretting it in qualifying, bemoaning his lack of straight line speed. Nevertheless it was a more than respectable time. 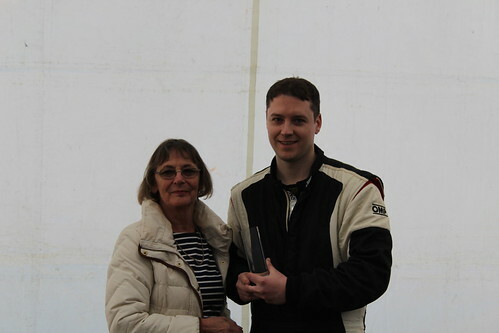 Next up was Andrew Fulcher, the leading Twin Spark Cup driver. He had suffered through most of the session with traffic, unable to get a clear lap in, and had pitted midway through to try and find some track space. This didn’t pay off initially but on his 10th lap he recorded a blistering time of 57.854 to grab the Twin Spark pole. 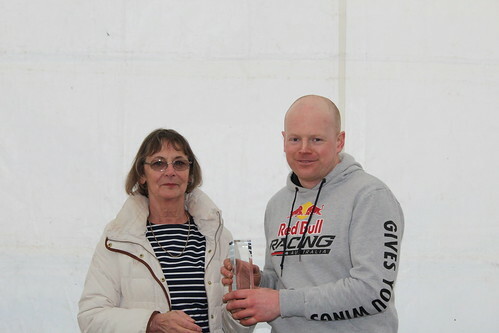 Had this been in the race he would have lowered Paul Plant’s Twin Spark lap record by 0.159 seconds – a stunning lap, and nearly 7/10s quicker than defending champion Tom Hill who was next fastest Twin Spark. Separating them on the time sheets were Richard Thurbin (see above) and Gary Miller. 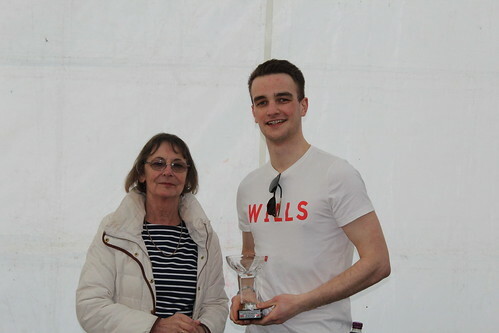 Gary recorded a time of 58.416 in his Punto – very respectable and it looked like there was more to come from car and driver in the race. The Twin Spark field lined up in the next 4 places behind Andrew and Tom. 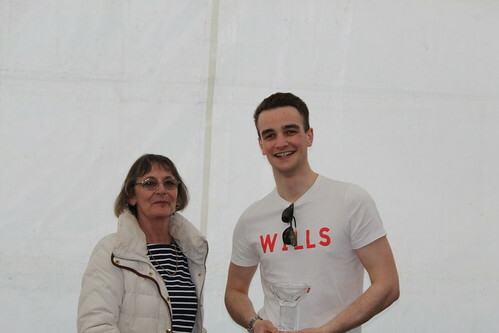 First up was Richard Ford, only 0.005 seconds behind Tom, followed by Steve O’Brien, 0.5 seconds back, and Andrew Bourke with a best time of 58.723. 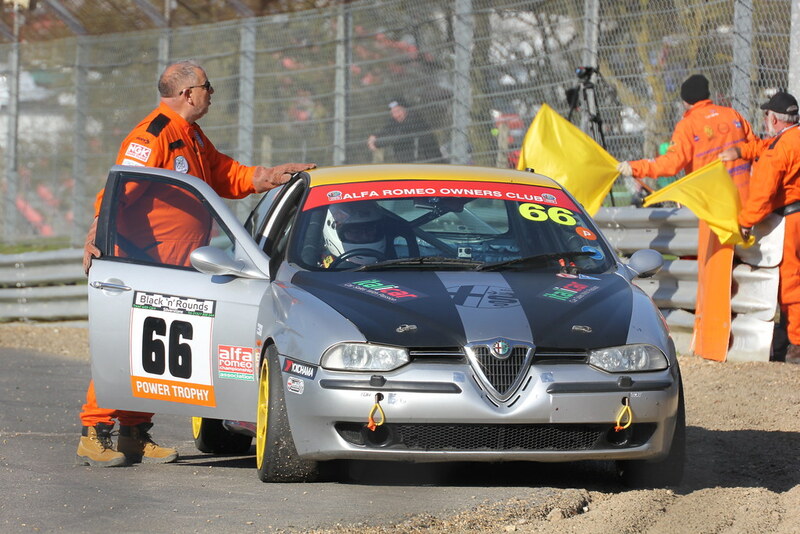 There was then a gap of 1.5 seconds to Cip Nistorica’s 156 with a time of 1:00.389. Throughout the morning in the paddock Ben Sharich’s MiTO had been a scene of feverish activity, with wires, cables and other parts all over the place as Davie Peddie and his team worked their socks off to get the car ready for qualifying. The new car looked great in its red and grey colour scheme but driver Ben Sharich was looking on anxiously at what seemed to be an almost impossible task for the team. However, they made it! 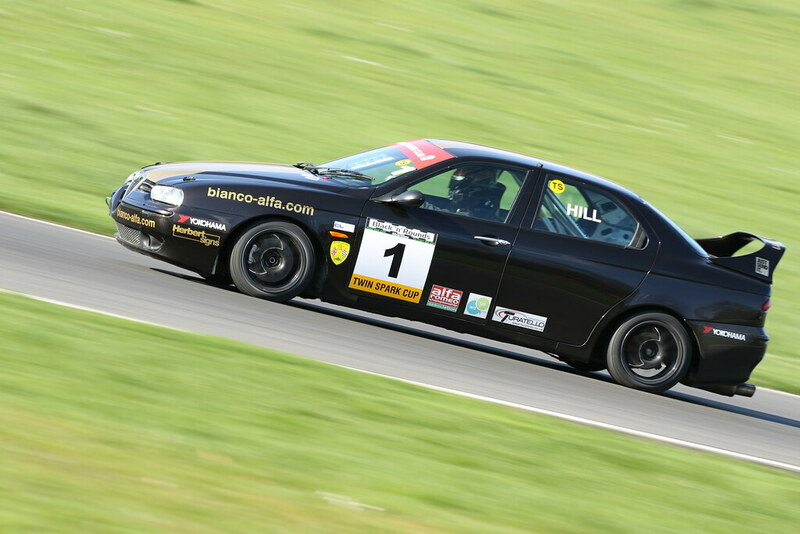 The car ran reliably throughout the session, with Ben getting to grips with racing a front wheel drive car for the very first time and recording a best time mid-session of 1:00.690. 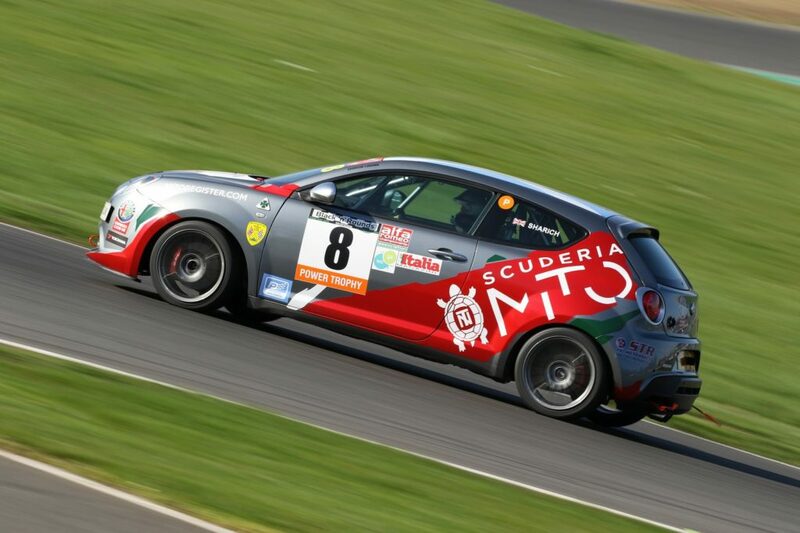 It was a remarkable achievement in the circumstances and a credit to all concerned, and it was fabulous to have a MiTO on the grid! There was destined to be more hard work in the paddock before the race was due to start at 6 PM in the Kentish gloaming. Richard Thurbin had a spare gear selector to replace the one that had sheared in qualifying but, alas, it was in Aylesbury. Undaunted, telephone calls were made and the part was on its way, arriving in good time for the necessary repair to be made. 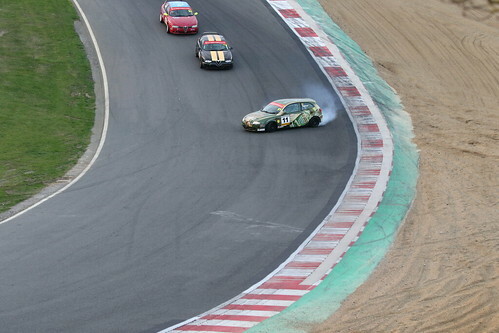 Mervyn Miller, however, was up against an even steeper challenge. The loss of drive proved not to be down to anything simple and he and son Gary embarked on a remarkable 4+ hour wrestling match with the engine and clutch housing to locate the source of the problem and to fix it if at all possible. A couple of times I approached them to see how it was going but forbore from interrupting their exertions at what was clearly an inopportune moment! 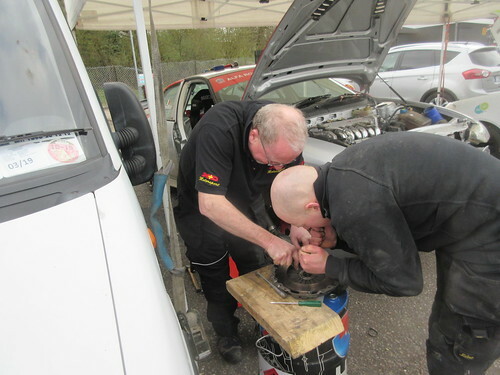 In the end they just made it, albeit without having time to reset the tracking, Mervyn giving the credit to Gary for a remarkable repair job. Everyone else – apart from the unfortunate Simon Cresswell – seemed ready to go when the drivers were called to the assembly area. Or were they? Weren’t those clouds of steam being emitted from the engine of the MiTO? Surely not, er, yes they were. Oh dear. It seemed that the cooling fan was not being brought to life when the engine temperature required. All the other cars were in the assembly area and I had to make my way to Race Control, asking Keith Ford to keep me posted on how things were going as the team decided they would have to hard wire the cooling fan so that it was running constantly. The track was now clear of Fun Cup cars and the hour was getting late. David Faithful asked for 4 more minutes but these passed and still no MiTO. Eventually the Clerk could wait no longer and the rest of the cars were released onto the grid – if it arrived the MiTO would have to start from the pit lane. 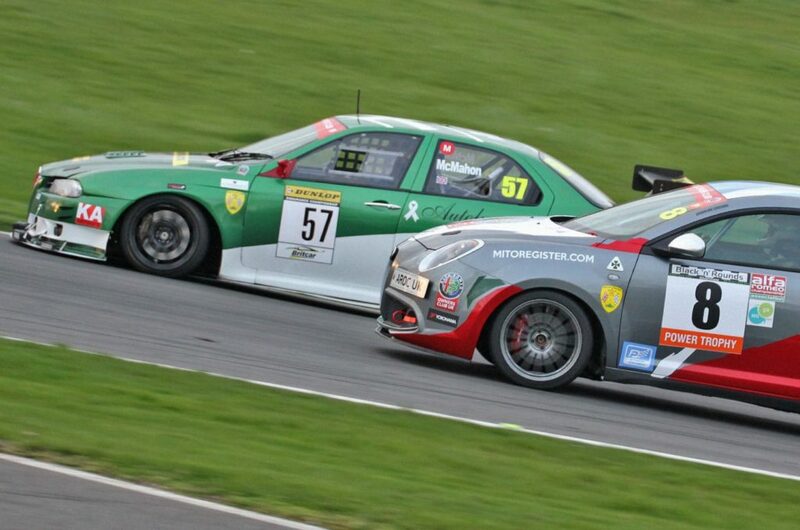 While the rest of the cars were on the green flag lap the MiTO finally appeared and lined up on the pit lane exit ready for the green light to show after the rest had started. Phew! 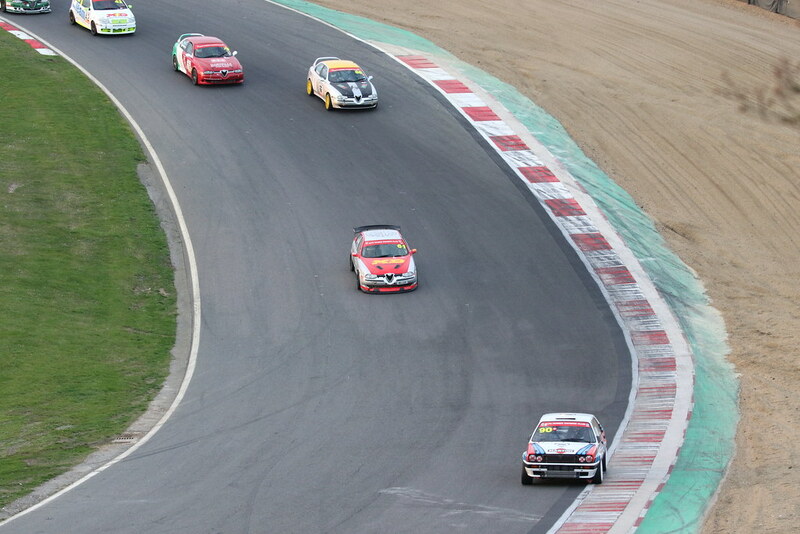 The start of the front group of Modified and Power Trophy cars was electric. Richard Thurbin’s Integrale, starting from the back row, shot through the whole field when the red lights went out, the 4-wheel drive giving fantastic grip off the line, and was well ahead by the time he turned in for Paddock and even further ahead by the time he got to the bottom of the dip before the rise to Druids. Wow, I thought, we’ve got a race on here, the gauntlet well and truly laid down to Barry and Mervyn. In contrast, Barry was slow away from pole, dropping behind Mervyn, Paul Webster, Dave Messenger and Gary Miller going through Paddock. He quickly disposed of the latter 3 but was still behind Mervyn at the end of lap 1, followed by Paul, Dave, Gary, Scott Austin and Keith Waite. There was an eventful start for the Twin Sparks also, though for different reasons. 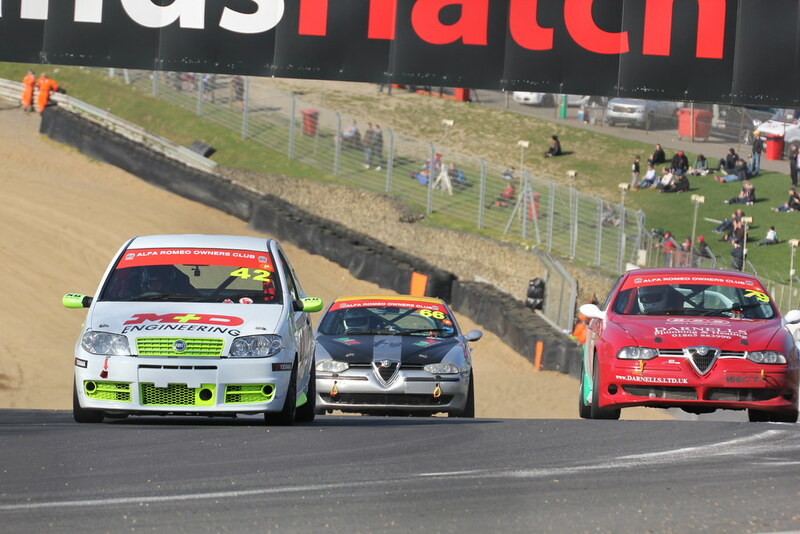 Andrew Fulcher made a great start from pole, leading Tom Hill and Richard Ford by a couple of car lengths entering Paddock but mid corner things started to go awry – he got sideways, corrected it but then went into a slide at the bottom of the hill and spun. Fortunately – or perhaps miraculously – everyone missed him without losing too much time apart from Cip Nistorica who had to take to the grass on the inside of the approach to Druids to avoid the 147. Andrew rejoined but at the end of lap 1 was some 5 seconds adrift of the rest of the field. 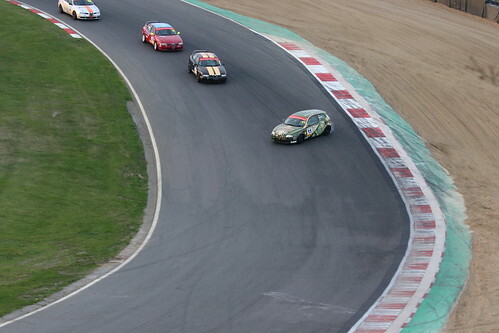 Tom Hill had taken over the Twin Spark Cup lead followed by Andrew Bourke, Richard Ford, Steve O’Brien, Eric Yim, Cip, Ben Sharich’s MiTO, and Andrew Fulcher. At the head of the field Richard Thurbin held a 5.7 second lead over Barry McMahon at the end of lap 2 but on lap 3 the chase began and the gap came down to 4.2, then 2.1, then 1.1 at the end of lap 5. For the next 3 laps the racing was exhilarating – a fierce dice for the lead between the two of them, side by side in places with Richard just managing to close the door in the nick of time at successive corners until they crossed the line at the end of lap 8 with Barry a whisker ahead; he then held this into Paddock and was through into the lead. Breathtaking! At this point Mervyn Miller was running 3rd some 26 seconds behind, lapping quicker than the Power Trophy cars behind him, but unable to keep pace with the front two. 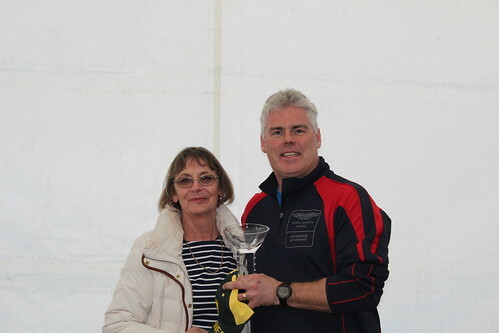 Paul Webster was leading the Power Trophy class some 7 seconds behind Mervyn and 9 seconds ahead of Dave Messenger, who was lapping around a second slower than Paul. 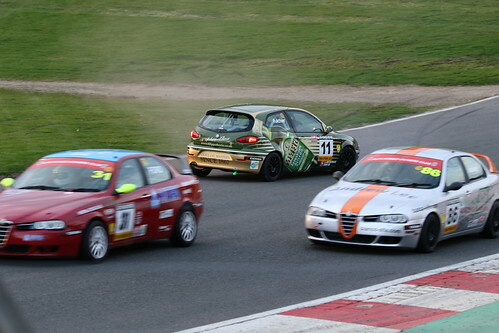 Gary Miller’s Punto was next with Scott Austin running close behind. Scott got past Gary on lap 7 and held the place for the next 3 laps but then his engine began to labour and Gary was back through on lap 11. Ahead Dave Messenger was starting to experience understeer and his pace had dropped noticeably to around the 1 minute mark while at the same time Gary’s pace was increasing, chipping away at Dave’s lead bit by bit until on lap 17 he got through into the class second place behind Paul Webster. 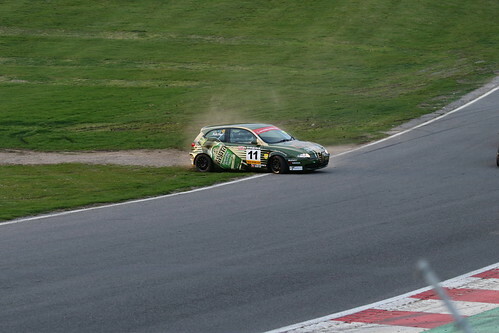 Ben Sharich’s MiTO had been at a disadvantage from the start, only being released from the pit lane after the Twin Sparks had gone by which gave him too much time to make up on the other Power Trophy runners. After lapping at 1.03 for the first couple of laps he settled into a consistent pace at around the 1.00 mark occasionally dipping into the 59s, but the car was running reliably and consistently in its first ever race, which was a credit to its preparation. I have no doubt that we will see it progressively developing its pace and set-up in the coming races. So where was Keith Waite among all this? The 33 showed respectable pace in the opening laps but the Twin Sparks were soon snapping at his heels. Tom Hill got past him on lap 3 followed by Andrew Bourke and Richard Ford a lap later. Sadly on lap 5 the 33’s head gasket blew and Keith had to retire the car. 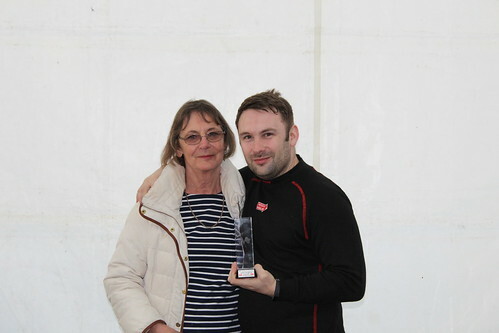 Keith and family packed up and went home that evening as he would be unable to take the start in Sunday’s race – a great shame. 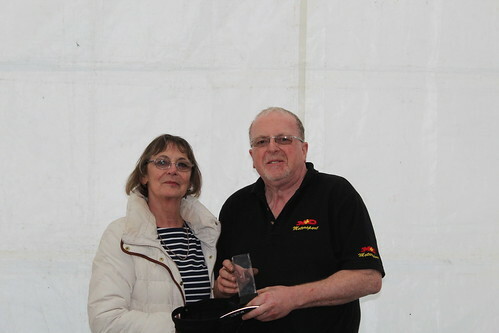 In the end, Barry and Richard had both lapped the entire field, with Barry taking the win by 11.4 seconds, the difference between the two being the 1-second difference in lap times, Barry setting a fastest lap of 52.037 despite having the turbo on low boost. 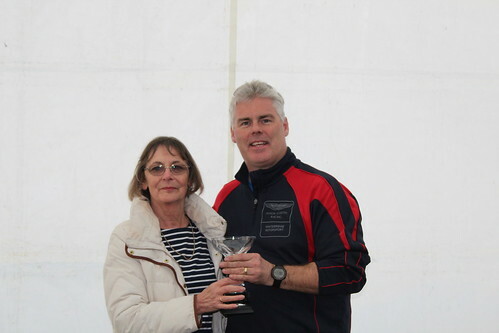 Paul Webster won the Power Trophy class from Gary Miller, Dave Messenger, Scott Austin and Ben Sharich, while Tom Hill was never headed once he took the Twin Spark lead, followed by Andrew Bourke, Richard Ford, Steve O’Brien, the recovering Andrew Fulcher, Eric Yim and Cip Nistorica. 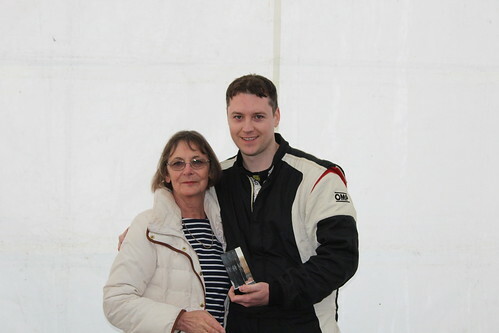 Paul Webster and Richard Ford took fastest laps in class, Richard only 2/10ths off Paul Plant’s Twin Spark lap record. Race 2 was scheduled for 2.30 PM on Sunday and both Barry McMahon and Paul Webster were considering an assault on lap records. 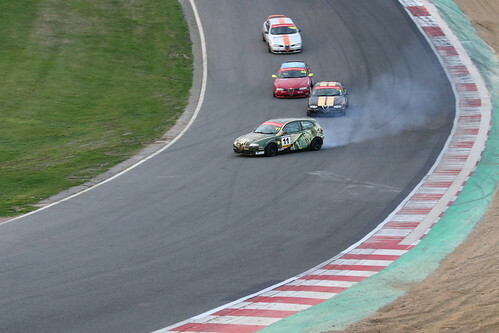 However, successive oil drops on the track – first by an MX5 then by a Track Attack car which laid oil down over 2/3rds of the circuit – effectively put paid to the idea. The race started 15 minutes late after a long delay while marshals laid down cement dust pretty well everywhere except the section from Surtees through to Clearways. 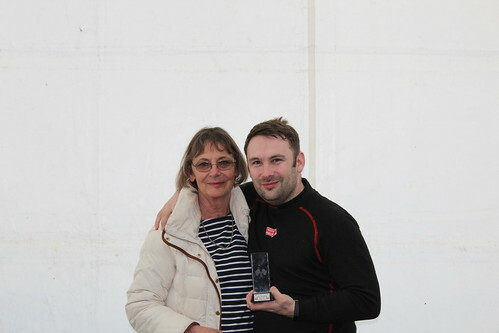 The delay had put the whole timetable behind schedule and the Senior Clerk of the Course ruled that for the rest of the day’s races the green flag lap would have to count as part of the race time. 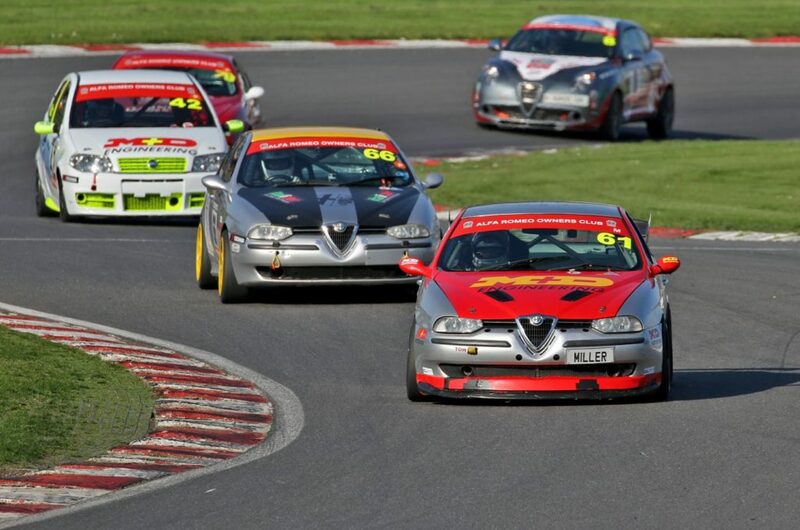 15 cars were to take the start after the retirements of Keith Waite and Simon Cresswell the previous day. 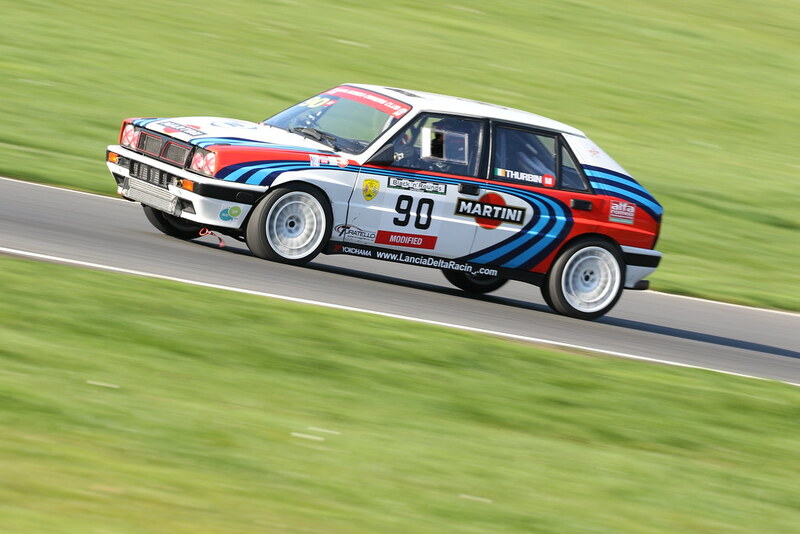 When the red lights went out the grip of the 4-wheel drive on the Integrale again took Richard Thurbin through into the lead at Paddock, though by a lesser margin than the previous day, from Barry McMahon and the rest in grid order. 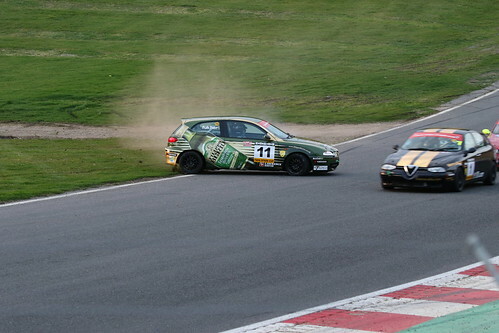 This time it was Scott Austin’s turn to commit an indiscretion at the exit to Paddock, the 155 sliding sideways down the hill and losing a major slab of time. At the end of lap 1 Richard Thurbin had a 1-second lead over Barry McMahon, then a 5-second gap to Mervyn Miller. In the Power Trophy Paul Webster led Gary Miller by just under a second with Dave Messenger very close behind Gary, followed by Ben Sharich and Scott Austin, Scott having been passed by the leading 2 Twin Sparks. 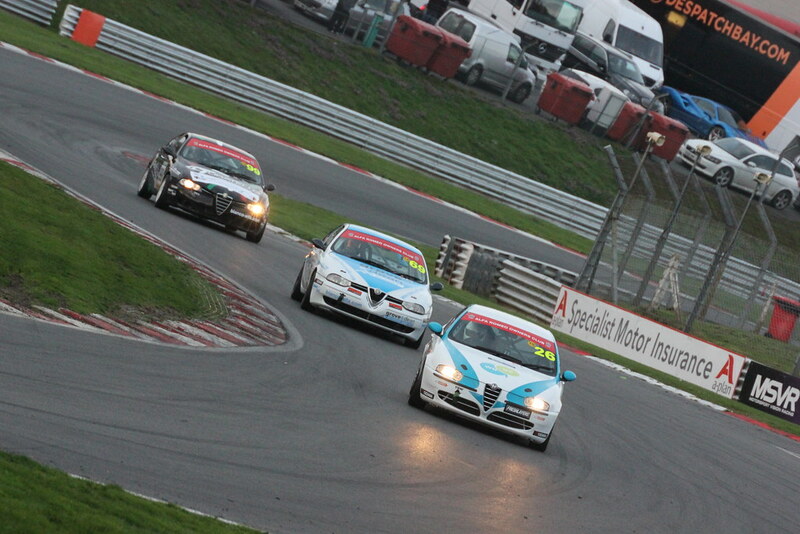 The Twin Sparks had got away in grid order with Tom Hill again establishing himself at the front. 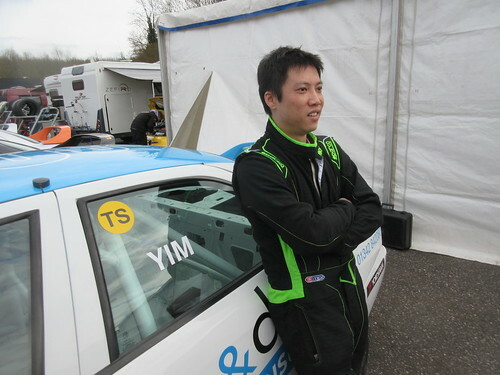 Andrew Fulcher passed Steve O’Brien and Cip Nistorica passed Eric Yim on the opening lap so the order was Tom Hill, Andrew Bourke, Richard Ford, Andrew Fulcher, Steve O’Brien, Cip Nistorica and Eric Yim. That order remained unchanged until lap 8 when Eric passed Cip. 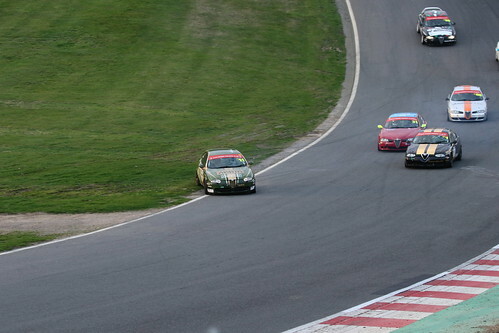 Tom Hill steadily built a lead over a close 3-way battle for second between Andrew Bourke, Richard Ford and Andrew Fulcher which went the way of Richard Ford on lap 11 when he passed Andrew Bourke on the start/finish straight after and Andrew made a mistake at Clearways, Andrew Fulcher also getting through into 3rd. Back at the front Richard Thurbin and Barry McMahon were circulating nose to tail from lap 3 onwards, Barry looking for a way through but being thwarted by sterling defence from Richard and perhaps an element of caution given the state of the track surface. On lap 5 he tried to go around the outside of Richard at Paddock and took the lead momentarily but then ran wide and had a trip through the gravel, emerging at almost undiminished speed but couldn’t to stop Richard reclaiming the lead. 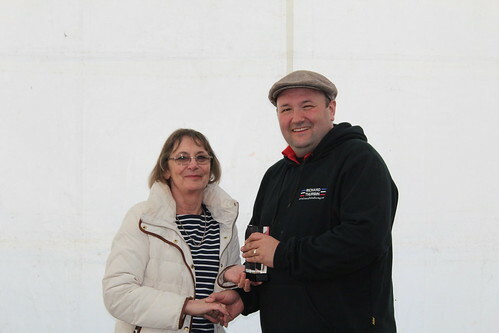 Mervyn Miller was 3rd lapping consistently in the 57s area, driving extremely well – not having the straight line speed of the front two but maintaining a significant gap to the leading Power Trophy car. 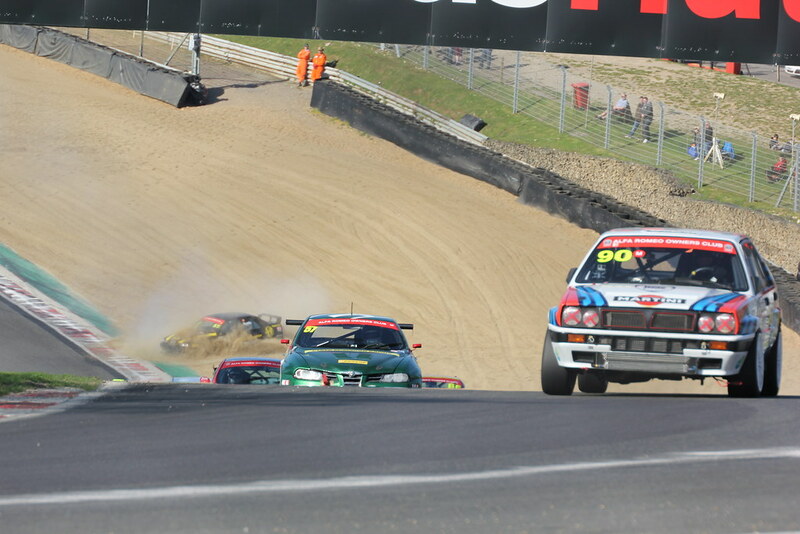 At the end of lap 6 Barry was right back on the tail of the Integrale and again passed Richard into Paddock, this time avoiding the gravel and keeping the lead. In the Power Trophy things were not quite going to plan for Paul Webster. He held the class lead for the first 4 laps but was unable to pull clear of Gary Miller and Dave Messenger who were nose to tail behind him. 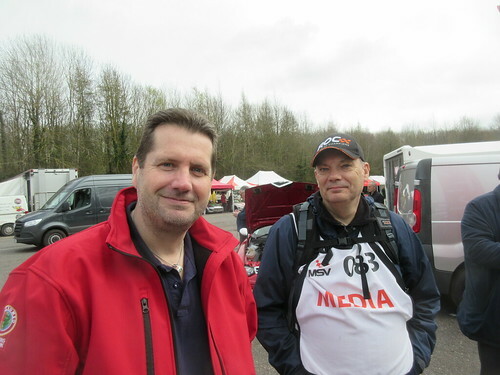 Then on lap 5 both Gary and Dave got through, demoting Paul to 3rd unable to match his pace of the previous day. 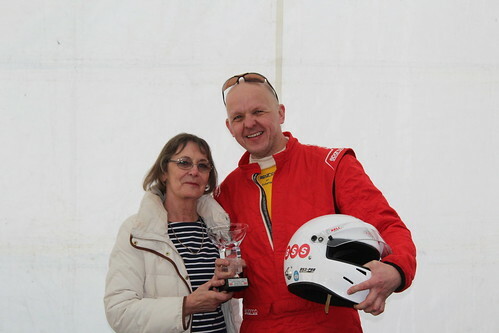 Briefly, Gary had the Power Trophy lead and was only a few seconds behind his Dad Mervyn. 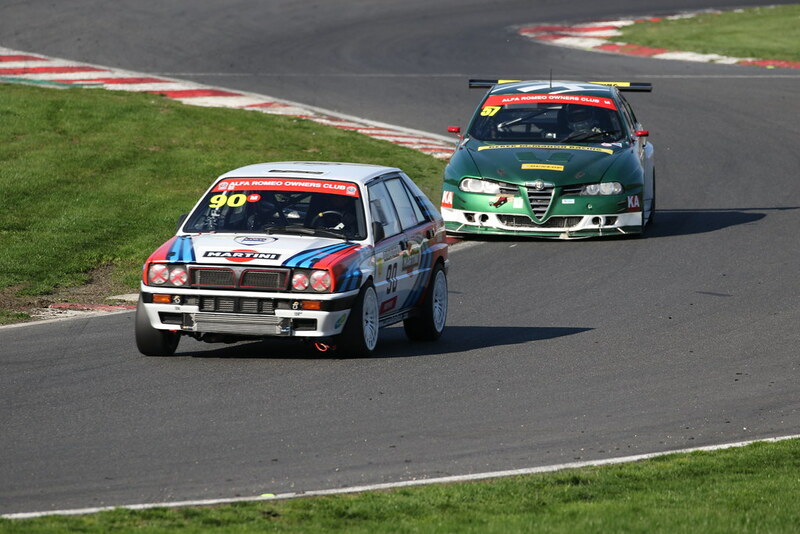 On lap 8 he and Dave were side by side on the start/finish straight but Gary held the lead through Paddock; however, a ‘moment’ on lap 9 cost Gary some 6 seconds and Dave took the lead with Paul also getting back past the errant Abarth. 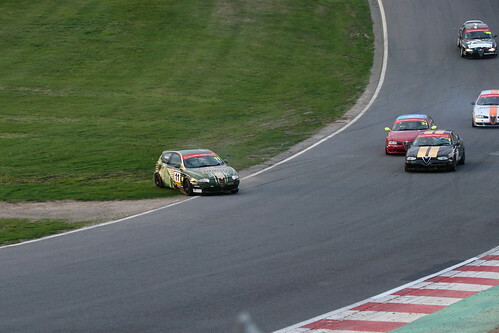 Meanwhile, Ben Sharich in the MiTO had been lapping around the 1-minute mark early on and held a gradually diminishing gap to Tom Hill in the leading Twin Spark, but a slower lap 5 saw Tom get past. After that Ben managed to dip into the 59s on lap 8 but then lapped just over the 1-minute mark for the rest of the race. He was, however, well clear of Scott Austin who was having a frustrating time in the 155. With his engine down on power he knew before the race that he was not going to be competitive but was intent on getting out there and recording a finish. That he did but finished last of all some 3 laps down and cursing his decision to buy a motorhome rather than a new engine! There was one more twist of fate in the Power Trophy. At the end of lap 14 Paul Webster’s 156 slowed dramatically crossing the start/finish line; he made it as far as Druids but then parked the car on the outside of the entry to the corner well off the racing line with what appeared to be clutch failure. 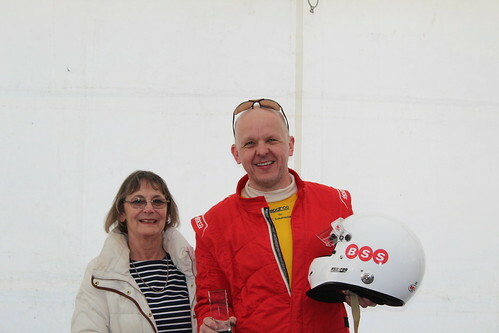 Dave Messenger therefore won the class with Gary Miller second (having recorded fastest lap and reflecting on what might have been…) and a delighted Ben Sharich third. In the Twin Spark class there was one more twist in the finishing order: after Andrew Fulcher got past Andrew Bourke on lap 11 he held the place till 2 laps from the end but then a trim panel fell over all 3 of Andrew F’s pedals briefly preventing him from either accelerating or braking and this handed third place back to Andrew Bourke. So Tom Hill won again, followed by Richard Ford, Andrew Bourke, Andrew Fulcher, Steve O’Brien, Eric Yim and Cip Nistorica. 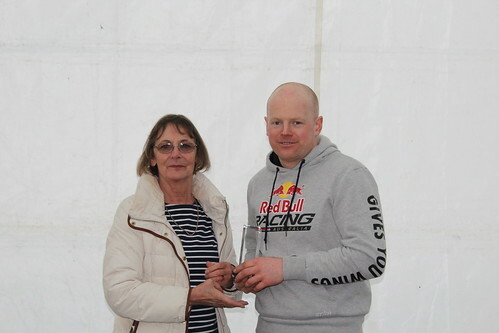 Andrew Fulcher did have the consolation of fastest lap – 58.208, less than 2/10ths off Paul Plant’s lap record, so near and yet so far…In the Modified class, Barry McMahon won, 4.3 seconds ahead of Richard Thurbin, Richard shaving 2/10ths off his best lap time of the previous day. Although Richard was still almost a second off Barry’s tremendous pace his lightning starts and strong defence made it a superb contest between the two of them before Barry’s extra pace told. 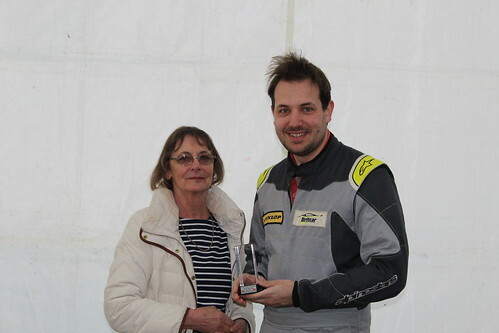 Mervyn Miller finished 3rd, a lap down but nevertheless it was a strong drive after Saturday’s car dramas. 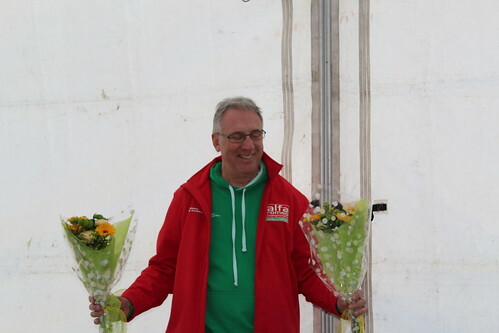 All in all it was an excellent weekend all round – 2 exceptionally good clean and exciting races and no one summoned to see the Clerk of the Course for any reason. 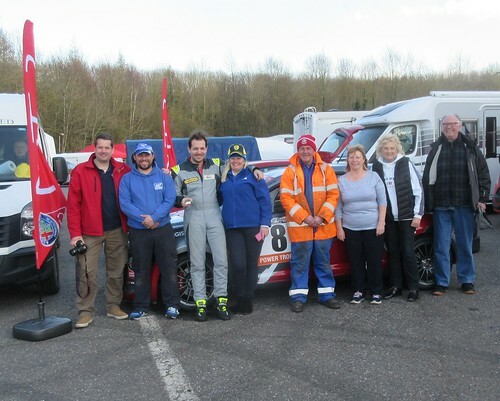 Some drivers were delighted, some would wish to have done better, but that’s always the way and the atmosphere between everyone was that of friendly rivalry and mutual respect. Long may that continue! 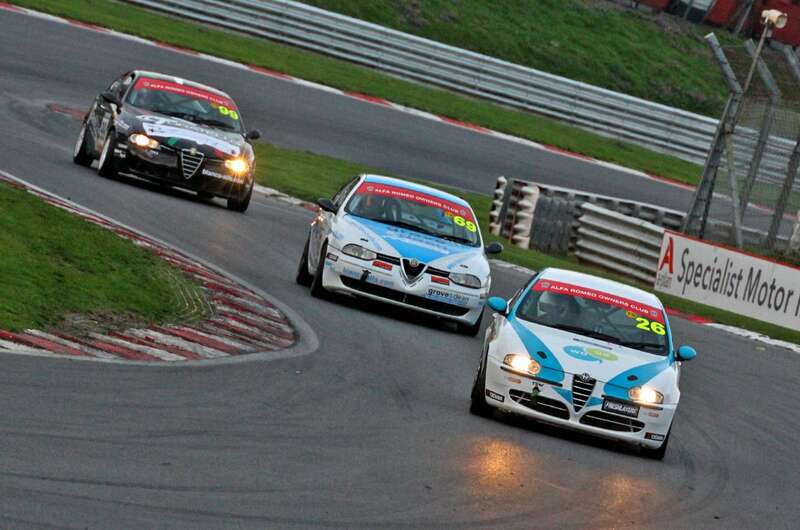 See you all at Snetterton!